Today’s smoothie pair features the healing properties of gelatin, which is something I’ve determined to include more of in my diet this year. If you’d like to learn more about the ways gelatin is wonderful for you…check out this post by Lauren at Empowered Sustenance. There’s a fun recipe there that you may enjoy as well. 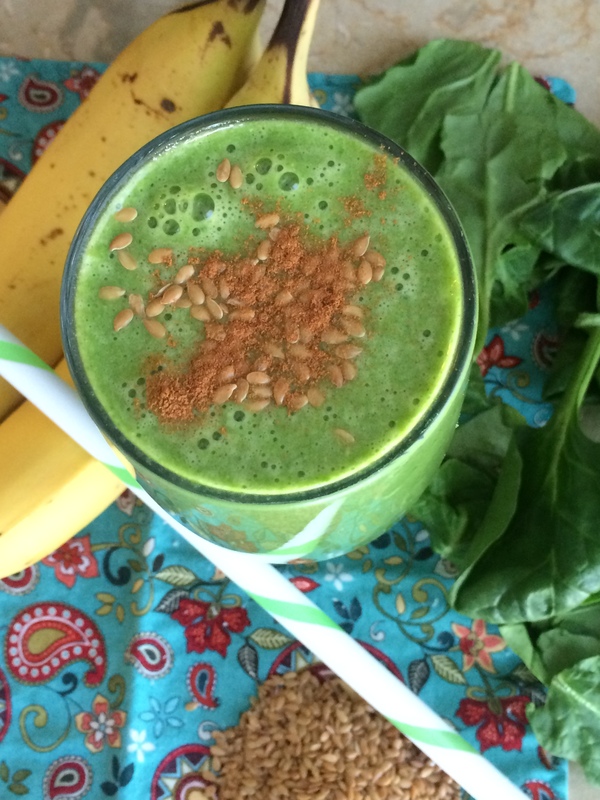 Smoothie #1 is deceptively creamy, but you would never guess it is dairy-free. For a vegan version, you could sub the gelatin for the protein powder of your choice. 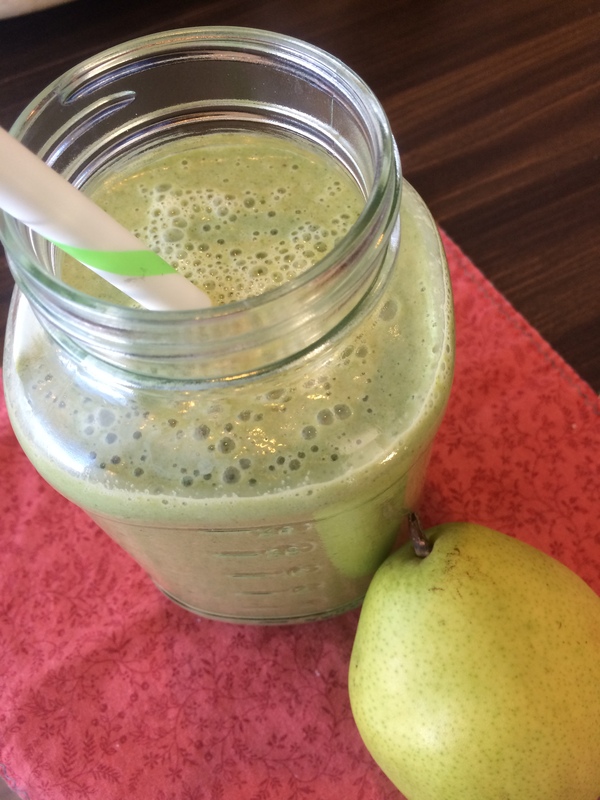 Pears and walnuts come together to make a creamy, silky smoothie bursting with vitamins E & C, as well as immune-boosting antioxidants. Arugula may seem an unusual addition, but it adds a bright peppy kick that will knock your socks off. Gelatin is an unsung protein hero, providing amino acids that serve as building blocks for collagen repair, as well as aiding in digestion. Process walnuts in blender with water until smooth. 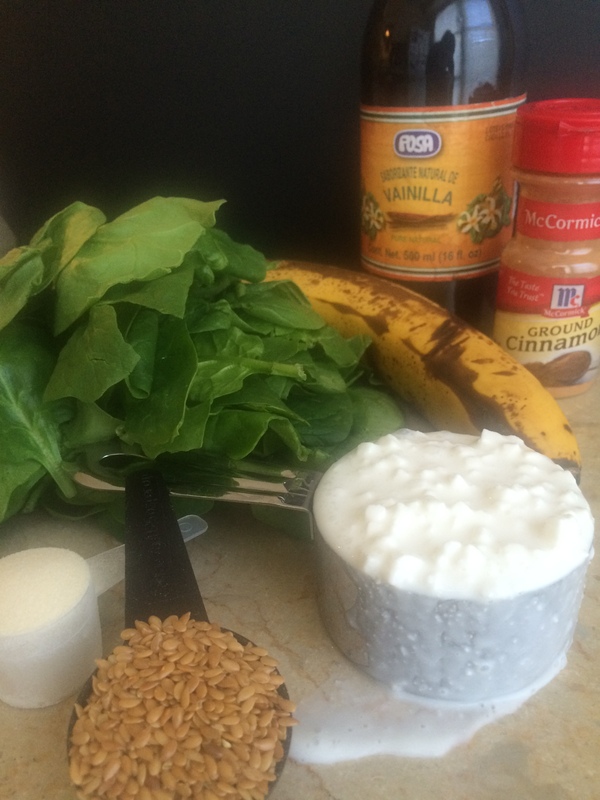 Add remaining ingredients in order listed, then blend until thick and creamy. Serve in chilled glass and enjoy! This is the smoothie that I will con my as-yet-unborn-children into drinking, by telling them it’s what the Incredible Hulk has for breakfast. 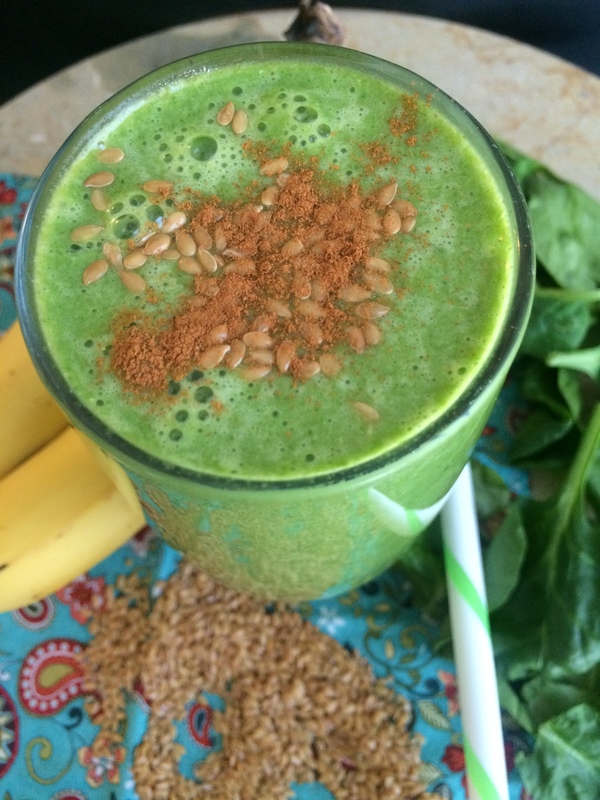 Hey, it’s green, and spinach made Popeye strong…sounds legit to me! Photo turned out a bit fuzzy…oops! I like smoothie bananas best when they start to turn brown because this maximizes their sweetness. Adding them frozen makes smoothies extra velvety & creamy. Golden flax seed supplies vitamin E and some nutty flavor that complements the vanilla and cinnamon rather nicely. Blend flax seed and water for about 60 seconds until smooth. Place all remaining ingredients in blender in order listed and process until smooth. Sprinkle a bit of extra cinnamon when serving (because cinnamon is the food of the gods, and more is always better where it’s concerned). Beware: seriously sublime sipping experience ahead. And be sure to subscribe for updates via the “Follow” button below, so you can get my crispy creations right in your mailbox!